Last night, I had the opportunity to attend my first NBA basketball game, the Golden State Warriors vs the 76ers. My husband’s idea of date night: Free tickets courtesy of an educational technology firm called EverFi. They were sponsoring a group of high school students to attend the game. I agreed to go after being assured I wasn’t responsible for monitoring the children. Field trips are great, but not my idea of a hot date. 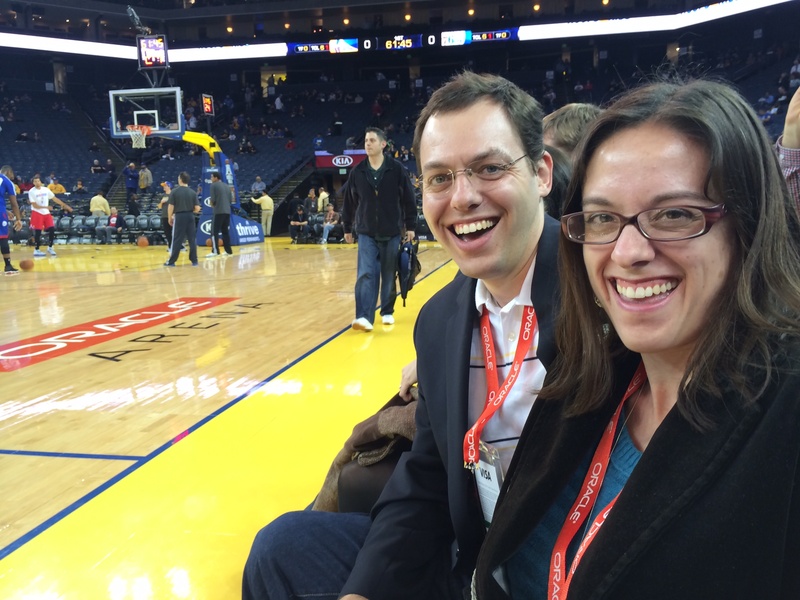 We met the EverFi folks in front of the Oracle Arena in Oakland. They seemed like a nice group, fluent in both regular English and Edu-speak. We donned our Oracle Arena lanyards with our Oracle Arena tickets, and were led by an usher into the Oracle Arena. He led us right past a line of people waiting outside a door marked VIP Entrance. As we cut in front of the VIP line, I started to think maybe my husband had the right idea about tonight. Later, we were given Wilt Chamberlain bobble head dolls. What I knew about Mr. Chamberlain is he slept with about a billion women. What I learned is that he scored one hundred points in a single game. Good to know they’re giving bobble heads out for that instead of the other thing, no? Another perk of being the EverFi guests: We got to sit courtside to watch the warm-up. Here’s a picture of us, which we immediately put up on Twitter and implied we would be sitting there for the whole game. Instead, it was about ten minutes. The gentlemen warming up were quite large and tattooed. That’s Marreese Speights, who ended up leading the blowout against the 76ers. Another player, Stephen Curry, was also really good, despite being neither as large nor as tattooed as his teammate. I did find his oral fixation a bit distracting. I mean, if you’re going to wear a mouthguard, shouldn’t it stay inside your mouth? I wore them back in my field hockey days, and I’m quite sure they don’t work when hanging out of your mouth. Although we passed on the $12 Bud Lights, I still had a great time. The company was fun, the game was exciting, and we even got featured on the Jumbotron. All we had to do was wave around some big red posters that read Oracle Arena while wearing Oracle Arena T-shirts. And now I can say for certain that I know exactly where the Warriors play, and it’s named after that sailboat that won the America’s Cup.